Welcome to our DolphinTrainer.com Shopping Cart, powered by PayPal®. T-Shirts using your Visa, Master Card, American Express, Discover Card or PayPal Account. happy to accept all Visa, Master Card, American Express and Discover Card purchases. ten. In other words, we'll pay the additional shipping charges on all items after the first one. You get free shipping! Sales Tax: Will only be applied to purchases shipped to California. someone prepares for this type of fascinating career? If so...then this is the book you've been waiting for. 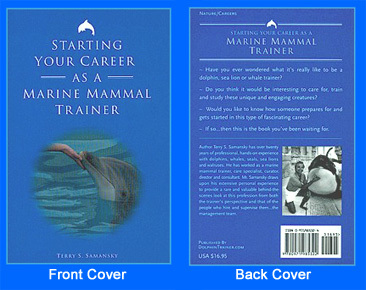 working with dolphins, killer whales, seals, sea lions, walruses and other marine species. Over the years, Mr.
numbers, email and website addresses. logo and lettering. 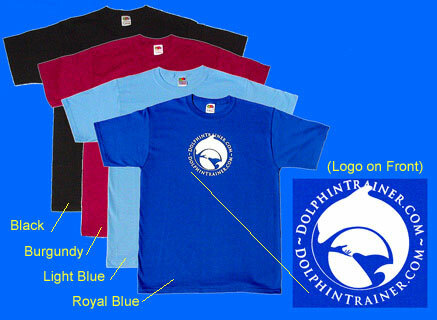 Now available in 4 great colors: Royal Blue, Burgundy, Black & Light Blue. Colors and sizes limited to stock on hand. "Silhouette" logo on the BACK. 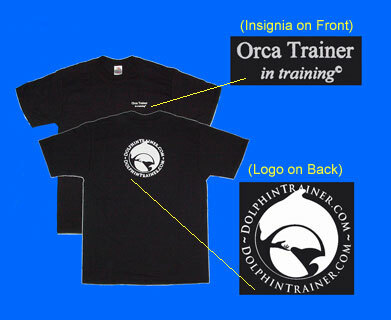 'Orca Trainer in training' insignia on the FRONT left chest area and our six inch diameter "Silhouette"
durability. All shirts come in black with white logo and lettering (distinctive orca colors). Sizes: Adult Small, Medium, Large & Extra Large. left chest area and our six inch diameter "Silhouette" logo on the BACK. 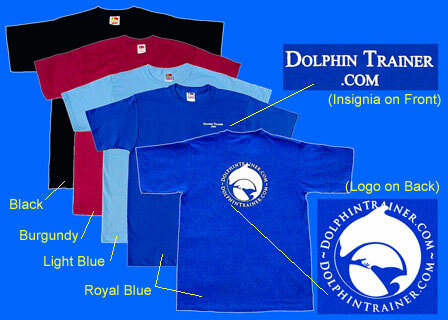 Our famous "dolphin touch" logo emblazoned right on the FRONT. Thank you for supporting DolphinTrainer.com!! 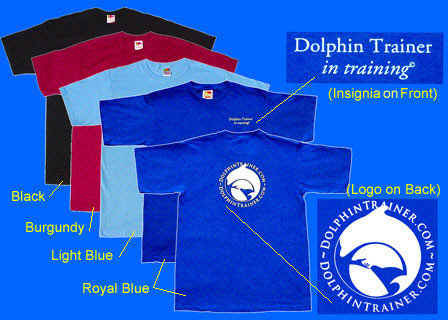 Copyright © 2000-2012 DolphinTrainer.com. All rights reserved.